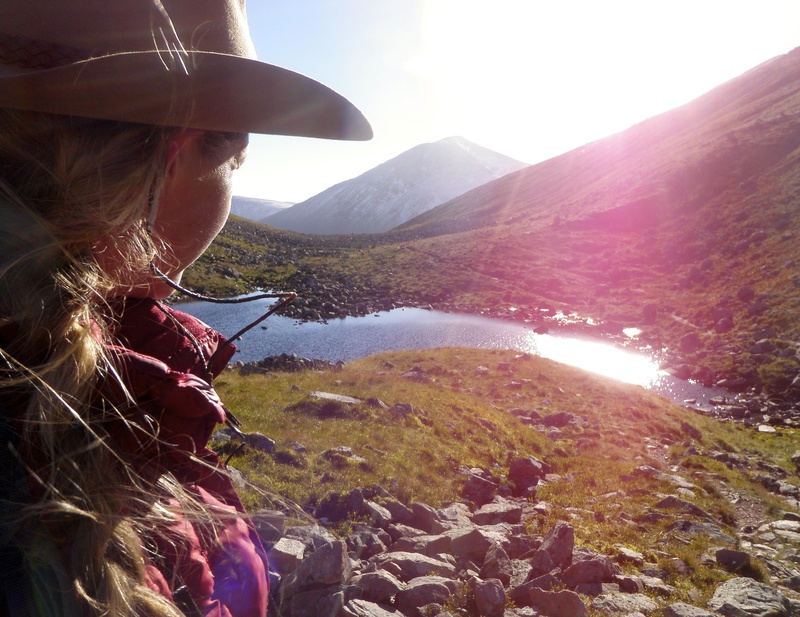 After peering down into the depths of the Lairig Ghru from Lurcher’s Crag, my dad and I decided to return the next day for a long trek through the glacially-carved canyon to the fabled Pools of Dee, the headwaters of the River Dee, one of Scotland’s famous whisky rivers. In Nan Shepherd’s ode the Cairngorms The Living Mountain she says, “I can conceive of no good reason for trudging through the oppressive Lairig Ghru, except to see [the Pools of Dee].” But I loved the long, rough rocky trek through the deep, narrow valley, about 7 miles, one way, a good long day in these fantastic mountains! This time we parked at the Sugarbowl parking lot, on the way up to the Cairngorms Ski Area. 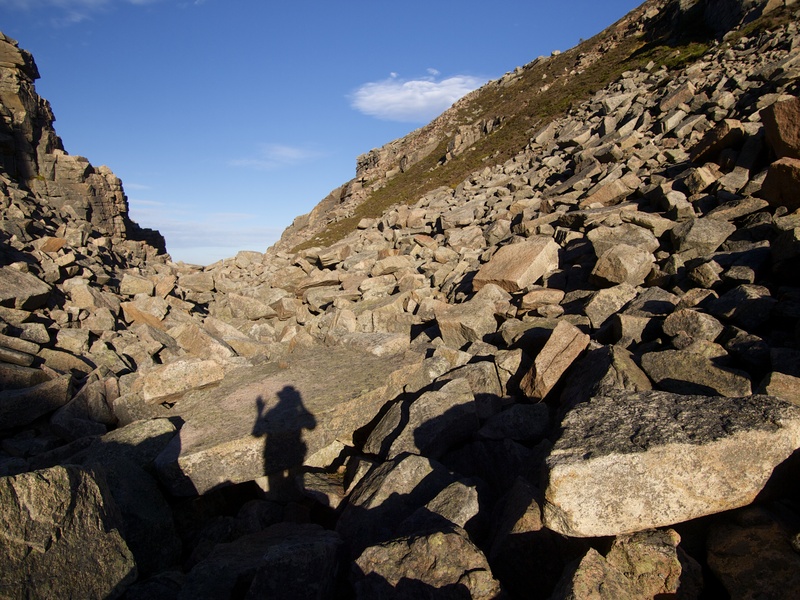 Chalamain Gap- the trail ran through this pit of unstable rocks, all coated with a thin film of ice. The rockyard was less than a quarter-mile long, but it took us over half an hour to negotiate it safely. Wearing gloves helped a lot on the rough, cold, icy rocks. All that remains of a memorial hut in the Lairig Ghru. The Cairngorms are notorious for wicked weather and many hardy souls have lost their lives in these mountains. Ahoy the Pools of Dee! At the Pools of Dee, the headwaters of the River Dee. Amazing that a whole river flows from this point. Return through Chalamain Gap, now thawed out and slightly less dangerous. Surreal Parting Shot. Ah, Scotland, this is Love. What is the animal in the picture? So cool that you get to share it with your dad. 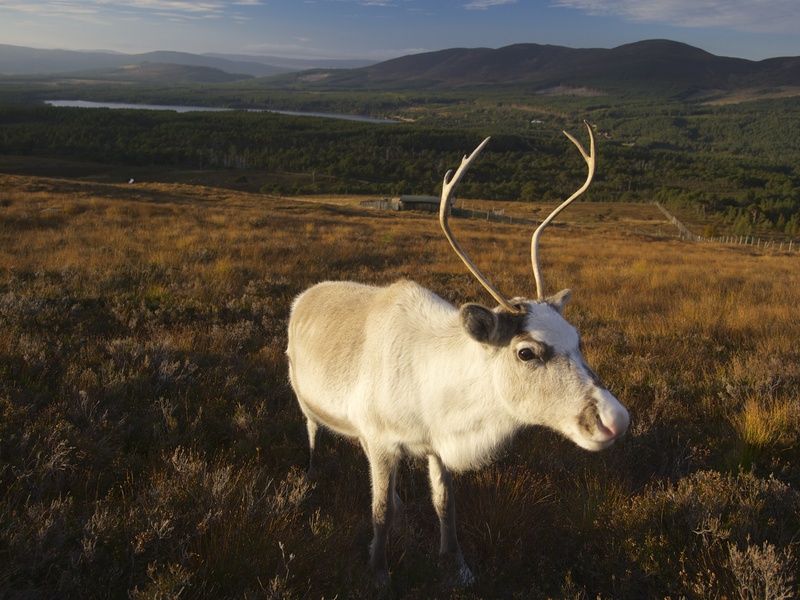 Of all the years I lived in Scotland, I never saw a single reindeer—you’re fortunate. Perhaps it was because it’s close to Christmas that that particular one was there and coming up to visit with you. I did see wild horses though—the only wild horses I’ve ever seen in my life. They were wonderful companions—really quite nice if you just walked up to them real slow or stood waiting for them to come up to you eventually. I just adore Scotland, must come back! Awesome photos! Beautiful!! And how cool is that to meet a reindeer!! It is so neat that you are able to experience this with your dad! Thank you for sharing all this with us. I love that beautiful reindeer ! All this and a reindeer,too. You are definitely living right. Nice one with the unstable rocks in the Gap. Lovely shapes and shadows.